The Ear Gear Original is designed to fit hearing instruments from 1.25-2 inches. Ear Gear Original fits most hearing instruments that use a size 13 battery. The Ear Gear FM is designed to fit hearing instruments from 2-3 inches and for those people using FM attachments. 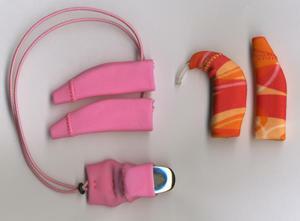 Ear Gear FM is also used to fit hearing instruments for people with sever hearing loss. Many of these instruments use a 675 battery.